Science Project _ Compare different toothpaste for their effectiveness? Compare different toothpaste for their effectiveness? Manufacturers of different brand toothpastes advertise their products with properties such as whitening, preventing plaques, flavor, protecting the teeth and killing bacteria. 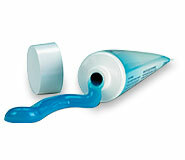 With so many competing claims, it is hard to determine which toothpaste really works. In this science project you will perform experiments to determine which toothpaste is more effective in removing food color and whitening.